As shown by this graphic, why are so many people in Maine taking advantage of the food stamp program? As shown by this map, why does Oregon have such a high level of food stamp dependency? These are just rhetorical questions since I don’t have the answers. But if we can come up with good answers, that could lead to better public policy. After all, if we want a self-reliant citizenry, it would be better if people were more like those in Nevada and less like the folks in Vermont, at least based on the infamous Moocher Index. But one thing we can say with certainty is that the food stamp program has morphed into a very expensive form of dependency. Jason Riley of the Wall Street Journal opines on the importance of reforming this costly entitlement. Officially known as the Supplemental Nutrition Assistance Program, or SNAP, the food-stamp program has become the country’s fastest-growing means-tested social-welfare program. …Between 2000 and 2013, SNAP caseloads grew to 47.6 million from 17.2 million, and spending grew to $80 billion from $20.6 billion… SNAP participation fell slightly last year, to 46.5 million individuals, as the economy improved, but that still leaves a population the size of Spain’s living in the U.S. on food stamps. …The unprecedented jump in food-stamp use over the past six years has mostly been driven by manufactured demand. The Obama administration has attempted to turn SNAP into a middle-class entitlement by easing eligibility rules and recruiting new food-stamp recipients. …Democrats tend to consider greater government dependence an achievement and use handouts to increase voter support. The president considers European-style welfare states a model for America. Making America more like Greece, however, is not good news for taxpayers. But the program also has negative effects on recipients. Contrary to the left’s narrative, we don’t have millions of starving people in America. …it now operates more like an open-ended income-supplement program that discourages work. Some 56% of SNAP users are in the program for longer than five years, which suggests that the assistance is being used by most recipients as a permanent source of income, not as a temporary safety net. …“Today, instead of hunger, the central nutritional problem facing the poor, indeed all Americans, is not too little food but rather too much—or at least too many calories,” Douglas Besharov, who teaches courses on poverty alleviation at the University of Maryland, told the House Agriculture Committee last month. “Despite this massive increase in overweight and obesity among the poor, federal feeding programs still operate under their nearly half-century-old objective of increasing food consumption. So why don’t we try to help both taxpayers and low-income Americans by reforming the program, specifically by “block-granting” it to the states? Uncle Sam picks up almost all of the bill. That means states have little incentive to control costs. Republicans argue that shifting to block grants would not only save money but also encourage states to increase the labor-participation rate of low-income populations. A state that has only so much money to work with is more likely to promote self-sufficiency in the form of employment, job-search and job-training requirements for able-bodied adults on the dole. Decentralization, Riley explains, worked very well in the 1990s with welfare reform. …1996 reforms…imposed more stringent time limits and work requirements on welfare recipients enrolled in programs like Temporary Assistance for Needy Families, or TANF. Welfare rolls subsequently plunged. By 2004, caseloads had fallen by 60% overall and by at least 30% in nearly every state. Child poverty, black child poverty and child hunger also decreased, while employment among single mothers rose. This was a welcome outcome for taxpayers, poor people and everyone else—except those politicians with a vested interest in putting government dependence ahead of self-sufficiency to get elected and re-elected. 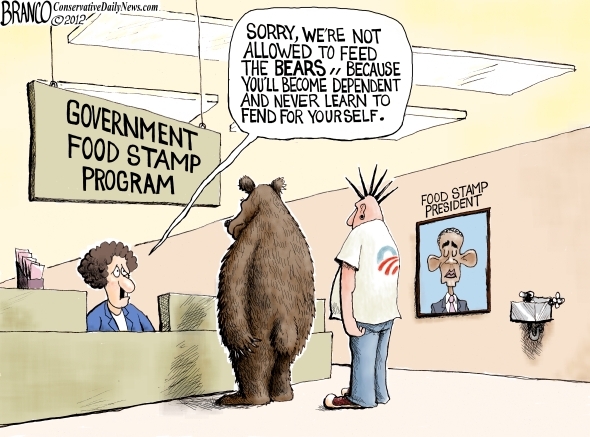 So kudos to Republicans on Capitol Hill for proposing to put the states in charge of food stamps. Just like they also deserve applause for working to block-grant the Medicaid program. This is something that should happen to all mean-tested programs. Once they’re all back at the state level, we’ll get innovation, experimentation, and diversity, all of which will help teach policy makers which approaches are genuinely in the best interests of both taxpayers and poor people (at least the ones seeking to escape dependency). Though I can’t resist adding one caveat. The ultimate goal should be to phase out the block grants so that states are responsible for both raising and spending the money. Let’s close with a few real-world horror stories of what we’re getting in exchange for the tens of billions of dollars that are being spent each year for food stamps. P.S. Shifting to another example of government waste, let’s look at the latest example of overspending and mismanagement by the Department of Veterans Affairs. Nothing, of course, can compare with the horrible outrage of bureaucrats awarding themselves bonuses after putting veterans on secret waiting lists and denying them care. But having taxpayers pay nearly $300,000 just so a bureaucrat can move from one highly paid job in DC to another highly paid job in Philadelphia should get every American upset. Here are some of the sordid details from a local news report. Rep. Jeff Miller (R., Fla.), who chairs the House Veterans Affairs Committee, has also raised questions about the salary and “relocation payments” to the new director of the Philadelphia office, Diana Rubens. Rubens, who was a senior executive in the D.C. office when she was tapped in June to take over the troubled Philadelphia branch, received more than $288,000 in relocation expenses. “The government shouldn’t be in the business of doling out hundreds of thousands in cash to extremely well-compensated executives just to move less than three hours down the road,” Miller said. …Under federal regulations, an agency can pay a variety of costs associated with reassigning an employee, including moving, closing costs, and a per-diem allowance for meals and temporary lodging for the employee’s household. I’m baffled at how somebody could run up such a big bill. Did she use the space shuttle as a moving van? Did she have to stay six months at a 5-star resort while waiting for her new house to be ready? Does a per-diem allowance allow three meals a day at the most expensive restaurant in town? This is either a case of fraud, which is outrageous, or it’s legal, which means it’s an outrageous example of government run amok. Regardless, it underscores what I wrote back in 2011. I will never relent in my opposition to tax increases so long as the crowd in Washington is spending money on things that are not appropriate functions of the federal government. …I will also be dogmatic in my fight against higher taxes so long as there is massive waste, fraud, and abuse in federal programs. Not to mention that we should never allow tax hikes when it’s so simple to balance the budget with modest spending restraint. Food stamps and other means tested programs have encouraged dependency in a large portion of our population. Clearly there is a need for total overhaul. Your suggestion that we change management from federal to state will not change the underlying problems and will create major disruptions as procedures are changed and many of the federal workers convert to state workers doing exactly the same thing under new logos. There does need to be a safety-net, however, it would be much more effective to build the safety-net into the tax code, so someone trying to climb out of poverty doesn’t face both new taxes and loss of benefits. If you are going to have a flat tax, that should be the top marginal rate, including loss of benefits, for the working poor and those with disabilities. It makes no sense to have higher effective marginal tax rates for this group than that paid by the top 1%. Eliminate food stamps all together. A wasted life has no value.